“Are you sure about this, Blue?” HowlingMoons looked up at his owner, uncertainty clear in his grey eyes. Blue smiled down at her red Gelert, appreciating his concern, but knowing she wanted to do this. “I want to do this,” Blue insisted, and Howl sighed. “Howl,” Blue laughed, “you don’t need to worry so much. I’ll be careful with my choice. Now, can we please go inside?” They’d been standing outside the Neopian Pound for at least ten minutes, and other owners and pets were starting to stare at them. “Fine, let’s go,” Howl agreed reluctantly. He followed Blue as she entered the Pound, his whip-like tail lashing worriedly. The pink adoption Uni pointed to the door leading to the adoptable Neopets. The door was a pretty pink color, and Blue opened it with a smile. Howl couldn’t help but look at the dark blue ‘Abandon’ door. There were cracks on the surface, and a spider web in one corner. Suppressing a shudder, he followed Blue into the adoption area. He found himself staring down a long hallway. At the end, you could either go left or right. The hallways were lined with cages. “That door really gives you a false impression, huh?” Blue muttered. Howl had to agree. The room they were in now was all grey, and most of the Neopets stared at them with dull eyes. Some were angry, though, and others looked hopeful. The pink door leading into this room really didn’t prepare you for what lay behind it. “Well, let’s look for a new pet, shall we?” Blue said quietly, and Howl nodded. The two of them walked slowly down the hallway, looking at the Neopets within the cages and reading their names. Howl felt bad for a lot of them; their owners sure didn’t seem to care about them if they gave their pets names like ‘1342459687_fjg’. He was glad Blue hadn’t named him something like that. “These names are horrible,” Blue whispered, and Howl nodded again. They continued down the line of cages until finally, Blue stopped. Howl looked inside the cage Blue was looking at and saw a red Xweetok curled up in the corner. She was the only one in the cage. “If you want,” Howl answered. Secretly, he was just glad his owner had decided on a cute little Xweetok and not a vicious Lupe or Eyrie. “All right. I’ll adopt her!” Blue decided. She took the key the adoption Uni had given her out of her pocket and unlocked the cage. Velvetts’ round ears twitched at the sound and she lifted her head. Howl felt even more relief at the innocent look in her large red eyes. She stood up and stretched, then walked out of the cage without even a look at Blue or Howl. “Ah, Velvetts!” Blue called after her, but the Xweetok didn’t pause. Blue glanced at Howl with a sheepish smile, and then she set off after Velvetts. Howl sighed. Maybe Velvetts wasn’t so innocent. Well, at least she was small—if she started being troublesome, she shouldn’t be too hard to deal with. “We’re almost home,” Blue promised Velvetts as the boat crossed the small stretch of water between Neopia Central and Brightvale. Velvetts didn’t reply, and Howl wasn’t surprised. She hadn’t said a thing the entire trip. Any time Blue tried to talk to her, she was met with silence or a contemptuous glare from the red Xweetok. Howl was ready to drag her back to the pound by the scruff of red fur on the back of her neck. Blue chatted on, but Howl wasn’t really listening. He was watching Velvetts and trying to tell what she was thinking. But her face was an impenetrable mask, and her eyes only held annoyance and contempt. He wondered if she’d always act like she owned the world—if so, he didn’t know if he’d like having her as a sibling. The boat finally docked, and once again, Velvetts stalked off without waiting for Blue or Howl. However, she soon realized she had no idea where she was going, and Blue smiled. She took the lead, heading down the dirt path that led away from the dock. Their home was close by—as they rounded a bend in the road, Howl could see the river they lived by. Beyond a small group of trees, he could glimpse the yellow roof. “See, there’s this cute little bridge over the river so we don’t have to get wet,” Blue told Velvetts as they crossed over the river. Velvetts didn’t reply—as usual—but when she saw her new home, she stopped dead. Blue didn’t notice at first, but finally, she stopped and turned. Howl had been walking behind them, and now, he watched Velvetts cautiously. Howl was so surprised to hear Velvetts talk that he almost didn’t remember what she’d said. Her voice was soft and sounded somewhat older than she looked—what with her size and how she’d been acting. After a few moments, her question registered in Howl’s head. “It’s our house—your new home,” he told her. “I have to live in that... thatched barn?” Velvetts demanded. “There’s no way I’m living in there!” Velvetts shrieked. Finally, Howl couldn’t contain his annoyance any longer. “It’s better than the pound, don’t you think?” he snarled. “Why don’t you adjust your attitude, unless you’d rather go back to that cage?” Blue looked horrified, but Velvetts turned to Howl and glared at him. She may as well have been a Darigan Lupe for how fierce she looked. “Would you stop talking to me like that?” Velvetts snapped, turning on Blue and cutting her off. “Stop acting like I’m someone to be pitied just because my owner left me! It’s not that big of a deal!” Without waiting for an answer, Velvetts bolted, disappearing over a small hill. Blue and Howl stood still for a moment, shocked. Then, finally, Blue bit her lip. “No, that’s not true, Blue,” Howl argued. “She’s just upset. I imagine living in the pound is no easy thing. 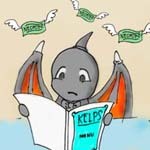 Anyway, we need to find her.” Blue nodded, pushing her feelings aside to focus on her new Neopet. The two of them ran in the direction Velvetts had gone, but by now, she wasn’t anywhere in sight. Howl could still smell her scent, though. “This way,” he said, and Blue followed him as he sniffed along the ground. Velvetts hadn’t crossed the river, thankfully, and her scent was still very strong. It wasn’t long before they found her sitting underneath a small tree. She didn’t look at them as they reached her. For a few moments, they were all silent. Then, Blue spoke. “Velvetts, I’m sorry if it seemed like I was pitying you. I just wanted you to be happy and feel comfortable around us. I’m sorry—please come back?” Blue waited patiently as Velvetts stared at the ground, thinking. Howl shifted on his paws, and then finally walked forward, touching his nose to Velvetts’ head. “You’re not going to find a better home than with Blue,” he told her. “And, besides,” he added jokingly, “she’s a marshmallow. I bet you could make her do anything you wanted.” Velvetts glanced at Howl, her eyes glinting with slight amusement. She finally stood up, stretching. “I guess,” she said, putting emphasis on ‘guess’ to make it seem like a huge sacrifice, “that I could live with you.” Blue smiled happily and Howl playfully flicked Velvetts’ ears with his tail. “Happy birthday to you; happy birthday to you. Happy birthday, dear Velvetts! Happy birthday to you.” Howl and Blue laughed as they finished their singing, and Velvetts smiled. It had already been a few months since she’d been adopted by Blue, and she’d remembered just a week ago that her birthday was almost here. Blue had immediately started planning a small little party with the only guests herself and Howl. Velvetts didn’t mind, though—it was a fun little event. “Well, are you going to blow out your candles?” Blue encouraged, and Velvetts laughed. “Sorry,” she replied, and taking a deep breath, she blew out the candles on the cake. Blue and Howl clapped, and Velvetts couldn’t keep from smiling even wider. She could still remember how much she’d hated having to live with them at first; now, she couldn’t imagine living without them. “All right, open my present first,” Howl said, handing her a brightly wrapped package. Velvetts grabbed it and carefully tore the wrapping paper. She smiled as she saw the cute blue Ixi plushie. “Thanks, Howl,” Velvetts told him gratefully. Howl grinned. “Okay, now for my present!” Blue cut in eagerly. She handed Velvetts a small box-shaped package wrapped in shiny, silver paper. Velvetts tore away the paper and carefully opened the box. She gasped at the sparkling, gold necklace. “It’s beautiful,” she breathed. “Thank you.” Blue smiled happily. “She doesn’t need to hear all the details, Blue,” Howl interrupted with a laugh. Blue closed her mouth and shrugged. “Well, she can at least try the necklace on, right?” she asked. “Here, let me help.” Blue carefully picked up the necklace and put it around Velvetts’ neck. It fit perfectly, sparkling gold and pretty. “Thanks again, Blue,” Velvetts told her seriously. Blue smiled.